If you’ve never had pho, you’re missing out. 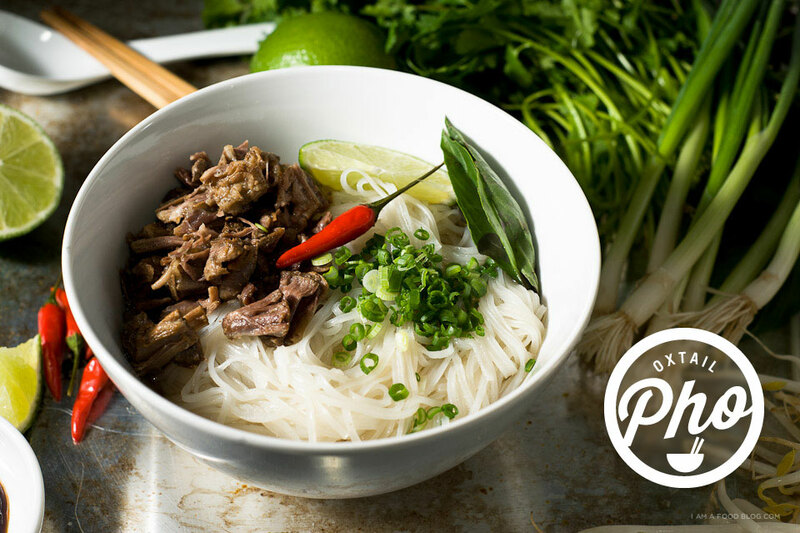 Slippery, thin rice noodles, flavourful meat, savoury stock and a bunch of fresh herbs make a bowl of pho something to covet when you’re looking for something filling, yet light. It’s simple enough to head out to a Vietnamese restaurant for a quick bowl, but if you’re looking for a particularly morish bowl of noodles, you should make the stock yourself. Yes, it’s a two day process, but this stock is like all good things: all the more sweet because it was worth the wait. This recipe uses oxtails to create a rich, deep, luxurious stock. Most pho recipes call for leg bones, but I went for all oxtails. I can’t say if there’s a difference between using leg bones or oxtails because I haven’t tried it myself, but the oxtail-only broth was some of the most intensely beef-y broth I’ve had. Even though this recipe is time consuming, it’s mostly hands off. You might be tempted to skip out on hard boiling the bones the first time around, but it’s an important step that results in a clear soup. Don’t forget to char your aromatics as well, it lends a complexity to your soup that you won’t get if you just pop in raw onions and ginger. 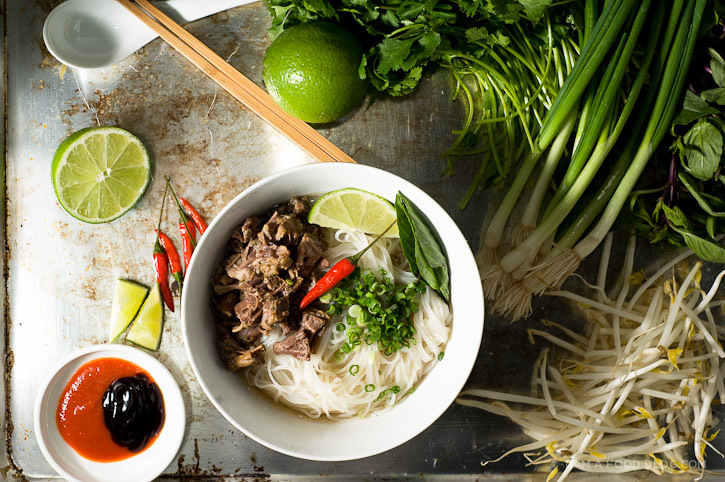 This pho takes a bit of effort, but at the end of it all you’ll have a giant bowl of noodles swimming in beefy deliciousness. Oh, and hoisin and sriracha are a must! i am robust, i am savoury: i am oxtail pho! Toast your ginger and onions in the oven on broil until the onions are sweaty everything is nicely charred. Peel the ginger and onions and set aside until you’re ready to start your broth. Put your oxtail pieces in a large pot with cold water and bring to a hard boil for 5-10 minutes to force the scum and impurities out. Drain, rinse the oxtails and wash your pot. Fill your clean pot with about 5 quarts of water and add the oxtail, ginger, onions, spice packet, cinnamon stick, carrots, and daikon. Bring to a boil and lower to a very gentle simmer, uncovered. Simmer for as long as you can; reducing it will intensify the flavour. I let my broth simmer for about 4 hours until the water reduced to 3 quarts. At this point take out the oxtails and set aside. Remove everything else from the stock and discard. Strain the stock into a new clean pot and cool before putting in the fridge overnight. Remove the meat from the oxtails and discard the bones. Shred the meat, cover and put in the fridge for the next day. The next day a large amount of fat will have coagulated on the top of your stock. Skim and discard. Gently heat the stock up and season with fish sauce and sugar. Add the sugar and fish sauce in increments until you’re happy with the flavour. Bring the stock to a roiling boil. Prepare your noodles according to the package, strain and place in a large bowl. Add a generous amount of oxtail meat (the stock will heat the meat up), top with broth, and garnishes. Enjoy! 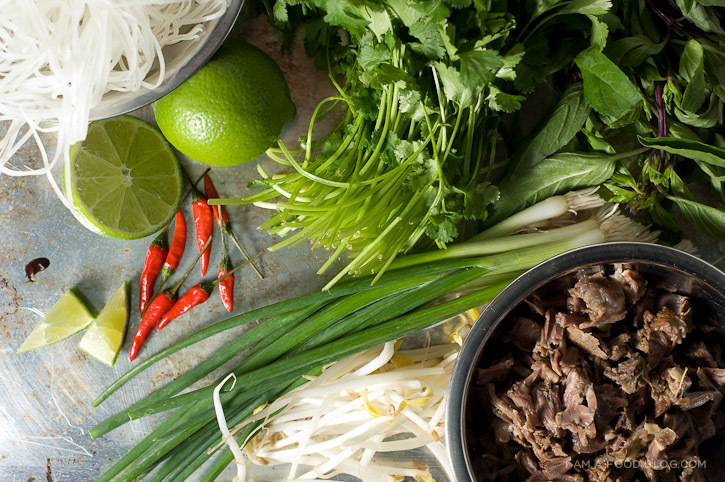 It may take two days to make but this is still the simplest beef pho recipe I’ve come across (that doesn’t cheat and use bought stock) – can’t wait to try it, as I can always get hold of oxtail but it’s much harder for me to get beef bones for broth. I’m going to try your recipe this weekend but wanted clarification as to when the carrots and daikon are added since it’s not mentioned in the instructions. I would assume they’re added along with the ginger, onions, and spices, but I may be wrong. Just ate this for dinner. So good. Love the charred onion and ginger. What a great way to use oxtail. Looks delicious. Going on our menu for next week! I have never had pho as good as my moms and it’s totally because she uses ox tail to make the broth. I can’t wait to try to make pho for the first time. What’s the daikon in the recipe for?? Aromatic for the broth? yes, it makes the broth slightly sweeter. Your instructions left out when to add the carrots and daikon. Is fish sauce used to replace salt in this recipe? This is my first time cooking with oxtail and found your recipe. Very excited to make it. When simmering the broth for the longer stretch, is it covered or uncovered. I’m thinking uncovered so it will reduce, as you mention, but don’t want to assume because we all know that’s not a good idea! Stephanie: Truly amazing web site, I’m 71, I have been taking “pictures since I was 8, I know what it takes to get the kind of pictures and food styling you are doing…truly supper amazing! One of the best investments of time and effort is to become really good friends with a butcher, patronize him only, give recommendations and ask your friends to tell the butcher you sent them to him…he will bend over backwards to see that you are happy! (As I am sure you are aware…it’s a cutthroat world out there in the grocery business!) This also applies to people that supply you with veggies, bread and etc. 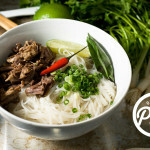 I have been looking for good pho recipe in a long time, and I think I finally found the perfect one. Your instructions were pretty easy to follow. Normally I mess up most of the recipes I try, but because you explained it so well I didn’t mess up this time! Also, I never tried putting sriracha. Thank you for adding that to your to serve list, it tasted really good. However, the pho itself was the best pho I have ever eaten. I also tried a lot of your other recipes, and the food always truns out very tasty. I will definitely try this recipe again and I wish you and your blog the best.